KHARTOUM- Sudan and Saudi Arabia have held in Khartoum on Monday high-level discussions on various aspects of military and security cooperation and coordination. The Sudanese side was headed by the Sudanese army’s Chief of General Staff, Lieut. General Emad al-Din Adawi, while the Saudi side was chaired by the Saudi Chief of General Staff, Lieut.General Abdul Rehman Bin Saleh Al-Bunyan. According to the official news agency (SUNA), the visit of the Saudi Chief of General Staff to Sudan comes at the invitation of Adawi and within the framework of strengthening relations between the two countries. Adawi told reporters following the meetings that they discussed military and security cooperation and coordination, saying the meetings comes at a time when bilateral ties between the two countries are witnessing remarkable development. He pointed out that the leadership of both countries have issued a number of guidelines to support and develop bilateral relations in order to respond to the challenges facing the Arab and Islamic nation. Adawi said the military exercises “Thunder of the North” in Saudi Arabia was intended to raise combat efficiency and readiness, saying the visit of the Saudi delegation would promote participation in the Islamic military alliance to fight against terrorism. For his part, Al-Bunyan said the visit aims to enhance joint cooperation for the benefit of the two nations and the region, pointing it also underscores readiness of the two armies to respond to any threats against the Arab and Islamic worlds. He mentioned the directives issued by the leaders of the two countries to support and develop military ties and exchange of experiences, pointing to continued joint work between the two nations. Sudan participates with over 850 troops in the Saudi-led “Decisive Storm” coalition against the Iranian-allied Houthi militants in Yemen. 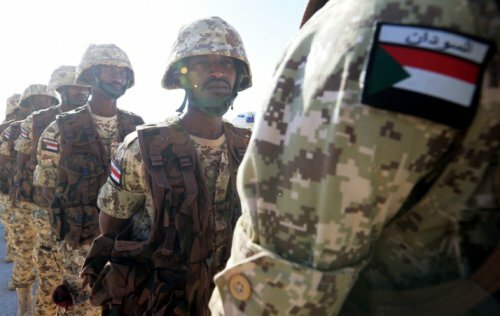 Also, last February Sudanese troops participated in the “North Thunder” military manoeuvres in Saudi Arabia among 20 other Arab and Islamic nations. The Sudanese military participation in the military campaign in Yemen and the Islamic alliance reconciled Omer al-Bashir’s regime with the Saudi government, and marked the divorce with Iran. Previous articleCould Africa be the next ISIS frontier?